10:19 – Balloons launched 19 minutes ago. I’ve got my Firefox tabs open, my phone in my pocket, and the oven warming up to cook some biscuits. All I need is some balloon-finding music. 10:27 – I’m combing through Twitter posts. “DARPA balloon in Anaheim.” A little vague on the location. Could be just trolling. “St. Paul DARPA” Uh, more information please. 10:40 – Searched for “heinz field” on twitter. Most of the posts were about some football game. Only one report of a balloon. http://twitter.com/Shabukiplz. Seems suspicious nobody else is mentioning the balloon. 10:46 – Claims for Fanuell Hall in Boston, and Duxbury, MA. Different balloons or one balloon seen from both locations? 10:49 – Some claims that the balloons are transmitting their location over shortwave radio. “Receiving data from a #balloon in Phoenix,AZ on 400.600 MHz Signal increasing in strength” Tweet from PhoenixScanner. Other similar tweets. 10:55 – Old Faithful, Yellowstone National Park. 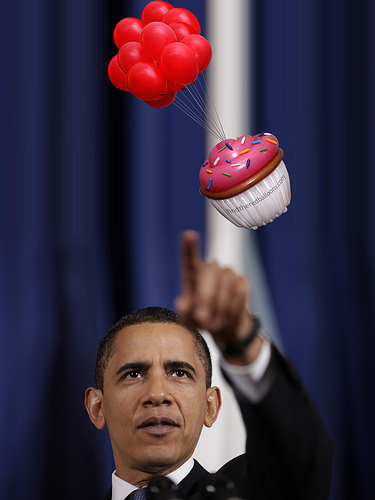 11:02 – Made the mistake of visiting 4chan thinking they would have balloon pictures. No pictures of balloons per se. 11:11 – Anybody know how to deblur a Photoshop blur effect? I know it’s been done before. 11:32 – Alright, it’s time to cook and eat those biscuits. Back in a few. 12:18 – I’m back. For all the possible sightings, my list is woefully poor. I’m also fairly confident about the Bithlo Speedway report. The last I heard, the Providence River balloon was a fake. 12:28 – Wow, the number of correct lists has climbed to 63. Courtesy of the balloonhq.com team. 1:10 – 10balloons.com/ has a map of user-submitted locations. I can’t imagine trying to keep that map clean. The first time I saw it, someone was spelling “HI MOM” with reported addresses. 1:31 – I’m reading 10balloonies.com/. They are also liveblogging the day, but they are trying to win the contest at the same time. BTW, I may have jumped the gun when I said the contest was already over. 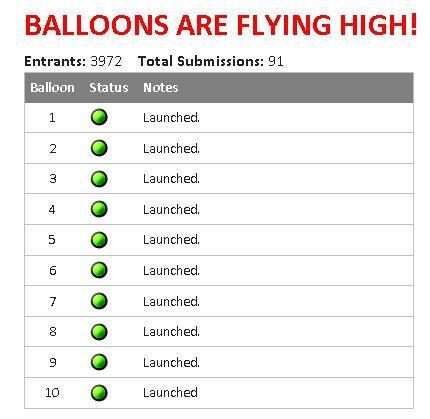 DARPA’s announcement of “Correct balloon locations submitted: 126” is (possibly intentionally) vague. I was reading it as the number of correct and complete lists. Many others are reading it as just the number of individual correct reports. 1:45 – Ummm. Kinda bored. Very few people are sharing information. Most of the action seems to centered on the competing teams. Or maybe I’m looking in the wrong places. I’m hitting various Twitter hash tags (lots of talk, very little info), a couple Facebook groups (nearly lifeless) and the blogs for some of the participants (interesting updates, but obviously no direct discussion of balloon locations). 1:50 – A group at MIT took the Multi-Level-Marketing (think Amway) approach. The balloon spotter gets $500, the person who referred the spotter to the group gets $250 and so on. I guess that might appeal. It certainly incentivizes getting a lot of people to join the MIT group. However, it doesn’t really incentivize going out and looking for balloons, which is really what generates value. This is one of the (many) problems with MLM in general. 2:28 – A balloon location with handy coordinates has been reported by some local press. Already numerous commenters are complaining about this news site “ruining” the contest by publishing the coordinates. I’m not sure how it ruins anything. Is this not just another piece of information to be found and filtered by the community? Is it real? How trustworthy do you find The Hook? Is The Hook website any easier to find than Cherry Avenue and Ridge Street in Charlottesville? 2:45 – Time for this balloon hunter to shave and shower. Thanks to everyone for sharing their tweets, emails and blogs today! I’ll check back in tomorrow. If you want to read about a very similar hunt (for one person free to travel rather than 10 moored balloons) check out the Wired story VANISH. 2:55 – Sorry, couldn’t resist one more check of the network challenge site. Now they are being clear. THERE IS NO WINNER YET! This entry was posted in Uncategorized and tagged liveblogging on December 5, 2009 by shotgunapproach.